You are currently browsing the tag archive for the ‘Planting seeds’ tag. 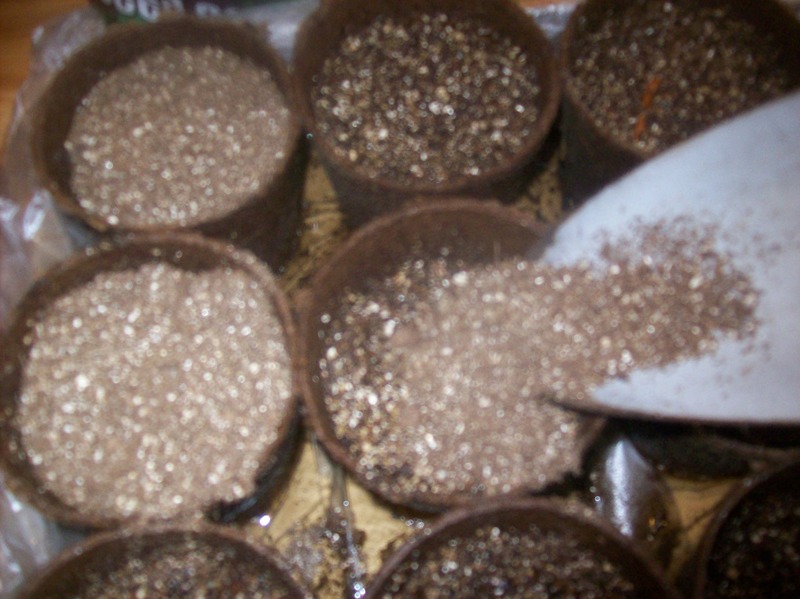 This is the second year that I have started seeds early inside to plant in my garden later. Last year, I’m very proud to say, I grew about 50 Roma tomato plants from seed, transplanted them to my garden in May, and harvested enough tomatoes to freeze 38 quarts of tomato sauce, a supply we are still eating from to this day. 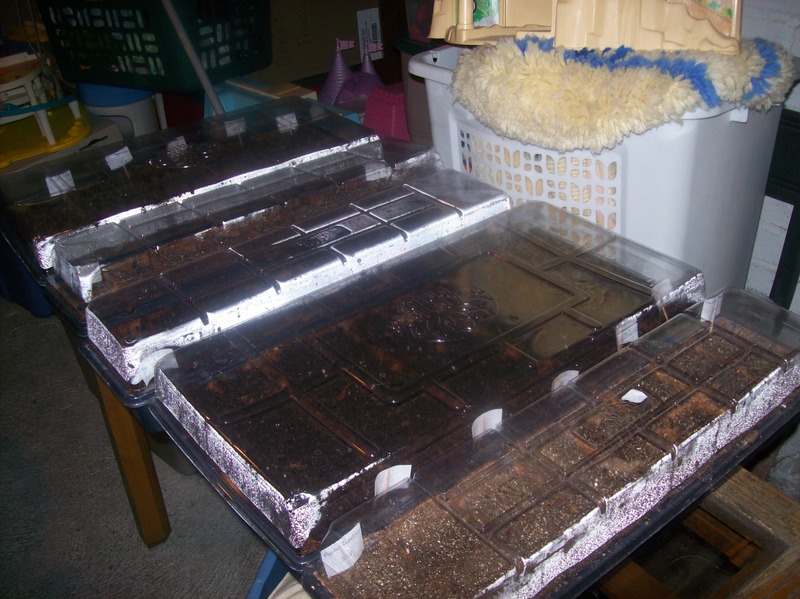 I learned a lot last year about starting seeds, which I did largely by following the directions on the seed packages and those that come with the seed starting medium and the little trays holding the peat pots. I won’t lie – I made a lot of mistakes. But with my experience came some knowledge that they don’t tell you when you buy these products. For one thing, I learned that you really don’t need the plastic trays. 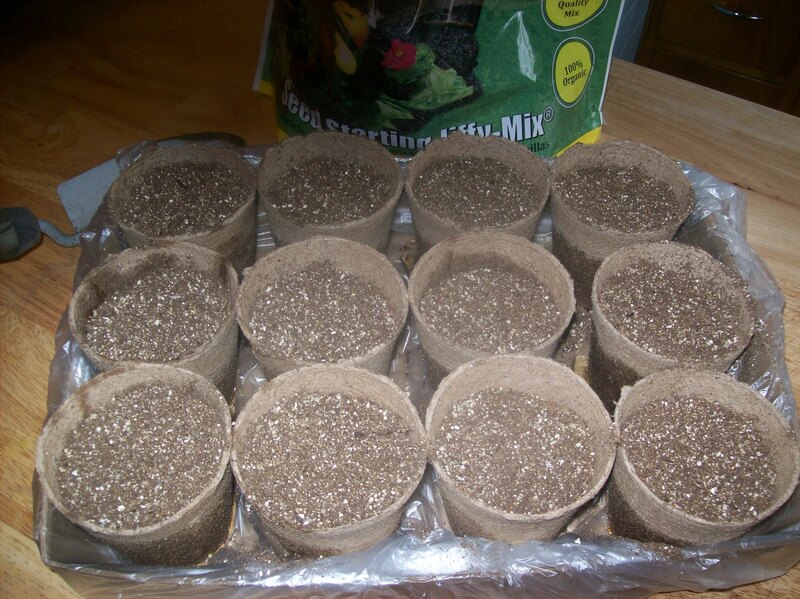 You just need something to hold the little pots of sprouting seeds until you can plant them in the soil. (Some people say you don’t need the peat pots too, but I’ve decided that I do, even if they don’t.) This year I am using plastic sweater boxes (without the lids) and shallow cardboard boxes, in addition to the trays I purchased last year. I still consider myself a novice gardener, but right now most of my seedlings are growing heartily for the coming season. 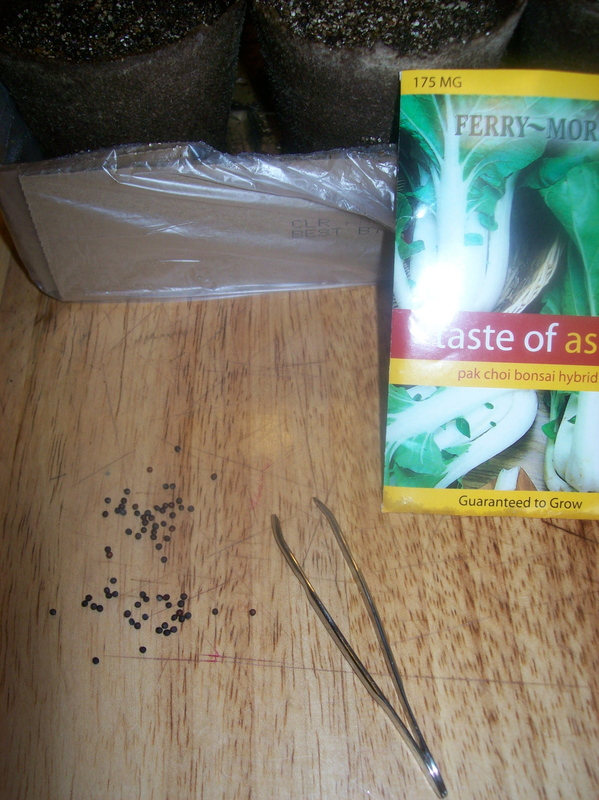 Yesterday I started a flat of bok choy, a vegetable I am planting for the first time this year. 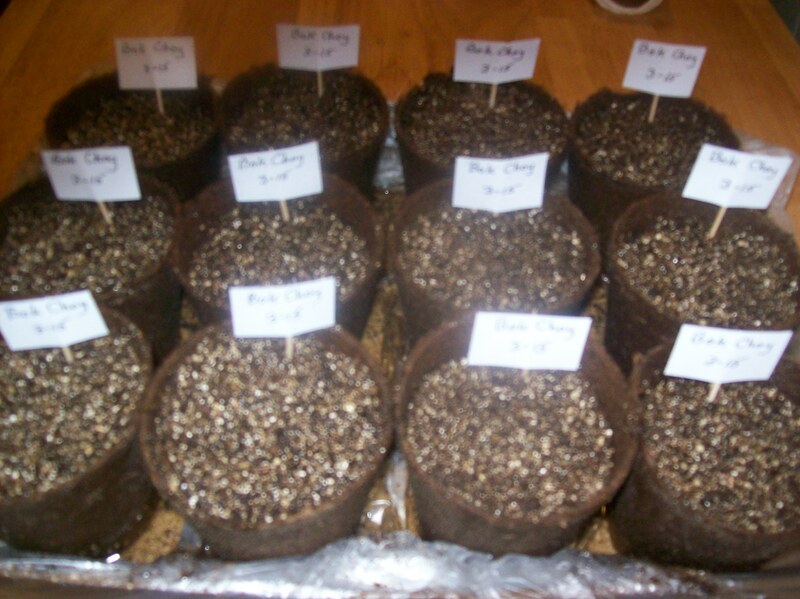 It occurred to me that many people might benefit from these inexpensive and fail-safe methods I have learned for starting seeds myself. 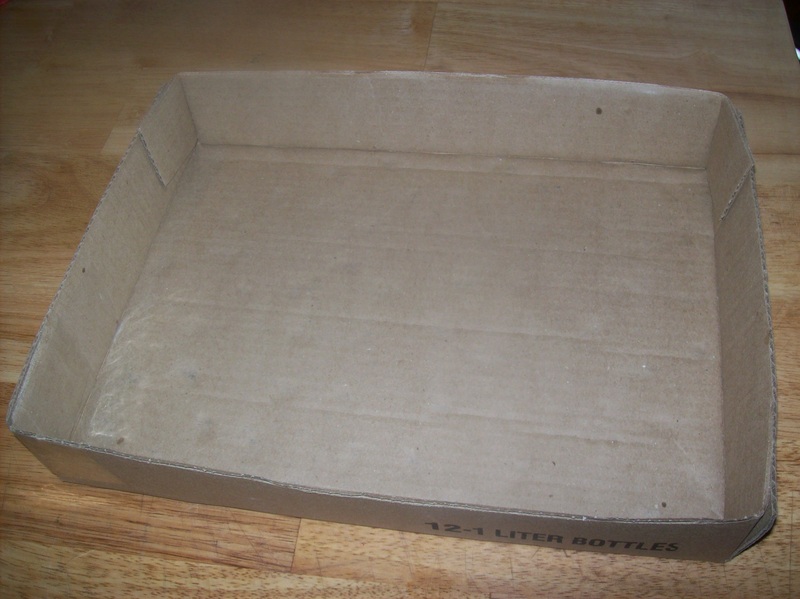 (1) Begin with a shallow cardboard box, the kind that canned goods and beverages are shipped in. 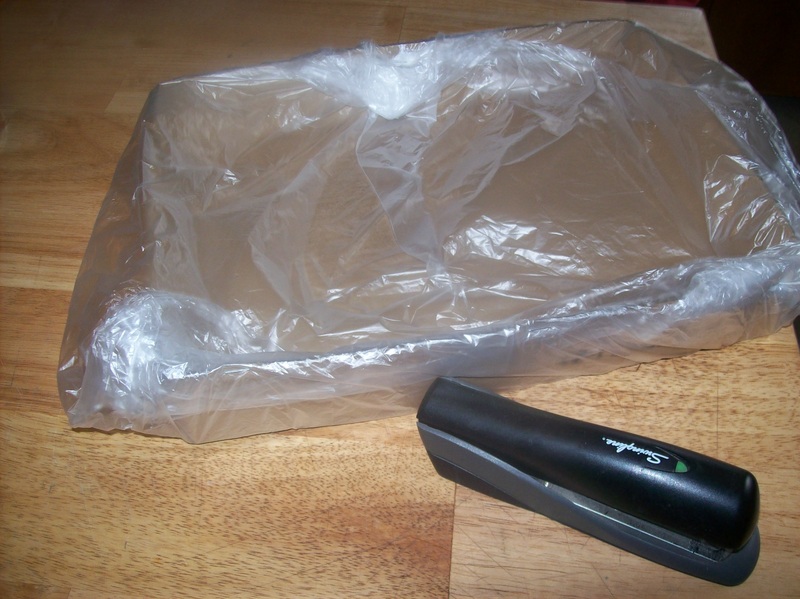 I used a small plastic wastebasket liner to line the box, making it leak free. I stapled the plastic in place at the top edges of the cardboard. (2) Place in the box medium-sized peat pots. For this project, I am using 12 pots 3 inches in diameter. These pots hold roughly 1 cup of soil or seed starting medium. I like this size when I am starting my plants 2 months before planting, because there is enough room for root growth until I need to transplant to my garden in May. If I use anything much smaller, I have found that most of my plants don’t have enough room to grow good root balls to keep them alive those full two months, and then I have to transplant to a larger size if I don’t want them to die. There are some plants that require less space — like lettuce — but yesterday I was starting a plant related to cabbage and in the brassica/crucifer family. These are not small plants. This is the size of peat pot that I used successfully last year for broccoli, a bok choy relative. 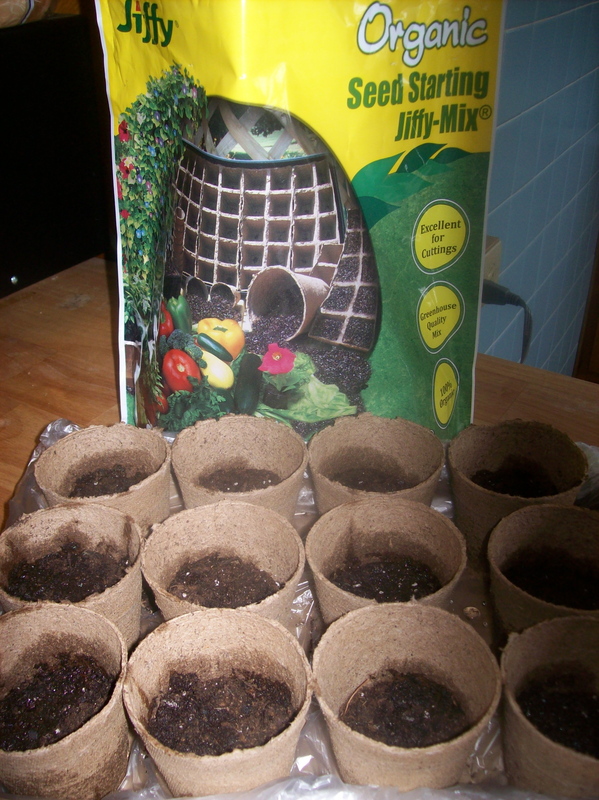 Earlier this month, I also used these or similar pots to start cauliflower, cabbage, brussels sprouts and kohlrabi. These pots were two dollars for 22 pots at Walmart. 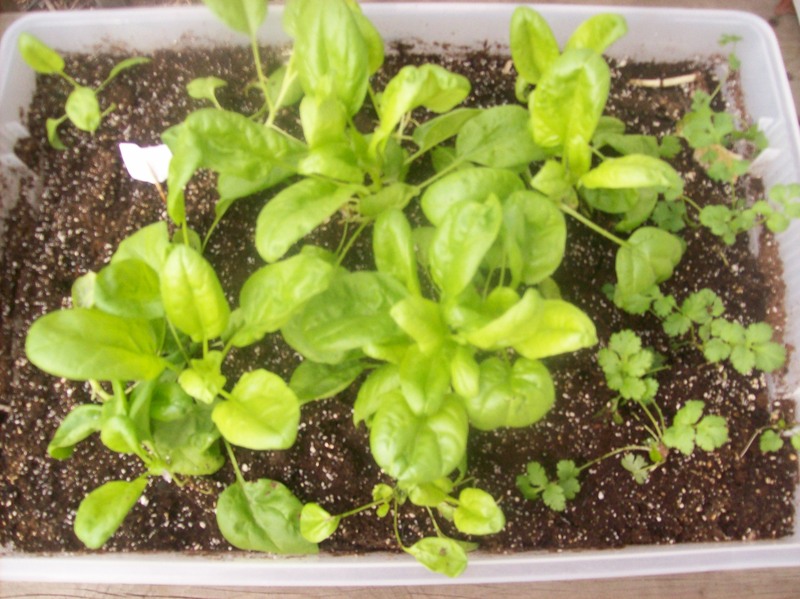 Of course, I only used twelve to plant this small flat, roughly $1.10 worth. I expect that I’ll also add another planting in late summer for a fall harvest. 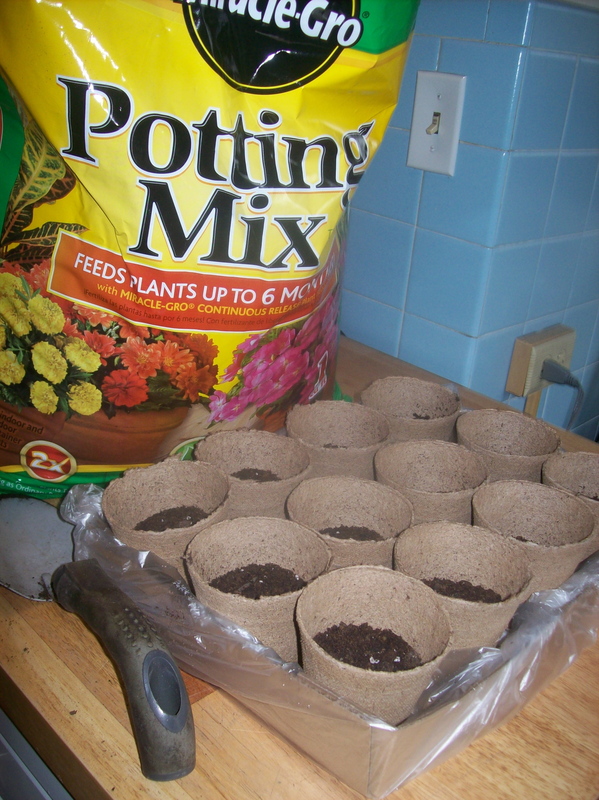 (3) Fill the bottom of the pots (only half up) with potting soil. I have found that in these larger pots, I can use regular potting soil in the bottom, saving the top half of the pot for seed starting medium, which is a little more expensive (I’m told you can make your own seed starting medium, but my self confidence isn’t there yet for that project.) If you are using the smallest 50-cell to a flat pots, don’t use the potting soil, as these have barely enough room for the starting medium. (4) After filling the peat pots half full with potting soil, add enough water to make the soil very wet. 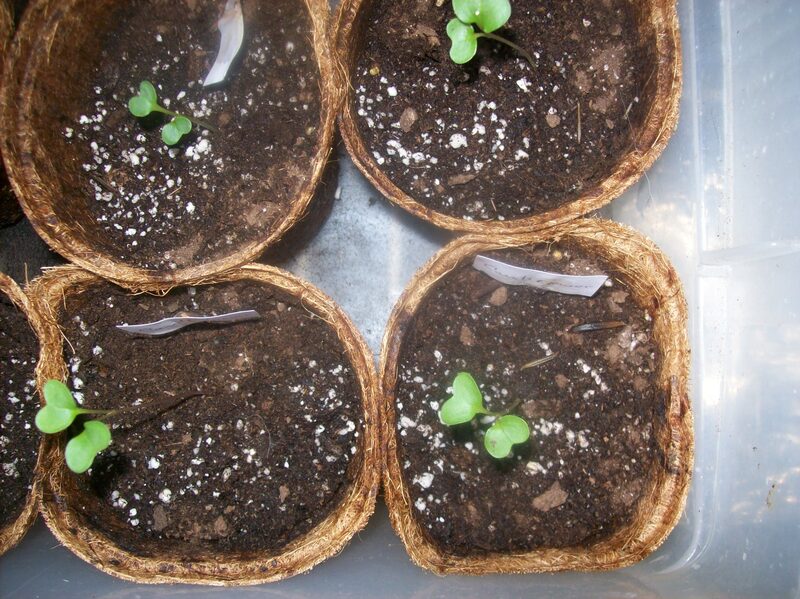 For my project, I used a quart of water for the twelve pots. 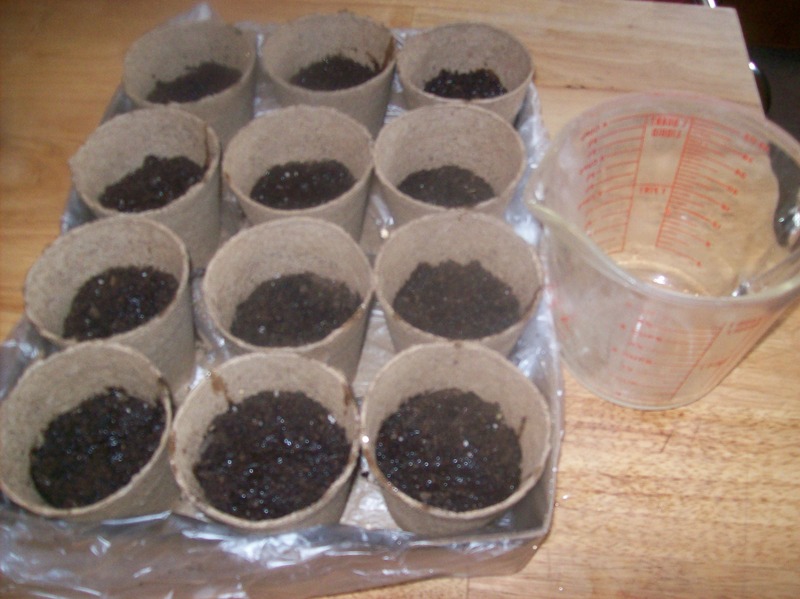 (5) Over the wet potting soil, fill the remainder of the peat pots with seed starting medium. This stuff is funny. Water doesn’t soak into it right away. It just runs through it. That’s why putting the wet potting soil on the bottoms of the pots helps, because it holds onto the water better. In time, the water at the bottom will wick up into the seed starting medium, which contains a high percentage of peat moss. But for a while, the medium kind of floats around on the water. (6) Slowly add more water into the pots (another quart for my project). As I said, most of it runs through the starting medium, but some water will get absorbed. The rest will be soaked up later. At this point there will be about a half inch of water standing in the bottom of my cardboard tray. This will quickly be absorbed into the soil and seed starting medium in the next few days, and it was no cause for concern. 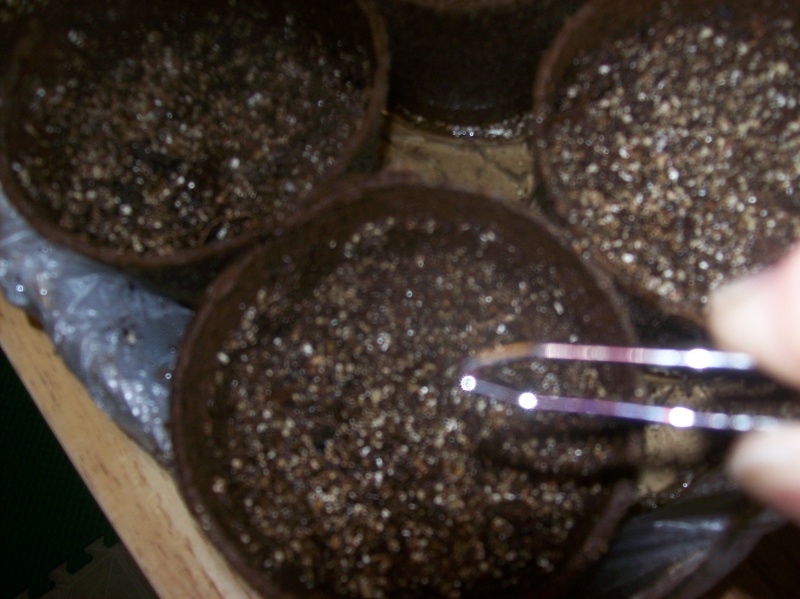 (7) Smooth out the surface of the seed starting medium with a spoon, and then mist the medium with water again. This allows moisture to be retained up at the top, where the seeds will be. Water signals the seeds to start growing, and they won’t grow until they make contact with the water. (9) Mist heavily again. This way we can be certain the seeds are getting the moisture they need to activate germination. This also gives the soil starting medium one more chance to hold in a bit of water right there next to the seed. (10) Cover the seed with the amount specified by the seed packet. (Bok choy and most other brassicas/crucifers need another 1/4 inch.) Then mist heavily again. Most of the directions I used last year warn against over-watering. I have found that slight overwatering (not flooding, but plenty of moisture) seems to give me my best results. By following these directions, I am making sure that the seed has initial moisture, as well as moisture for about one week, which is when I usually see sprouts for most (but not all) vegetables. Initially, with this strategy it will look as if the pots have been filled to the very brim, but after about a week, once the water has soaked more fully into the starting medium, it all condenses some, so that I will have pots with soil about a half inch from the top of the pots in the end. Then, finally, label every pot. You don’t have to be fancy. I use cut-up pieces of index cards taped to toothpicks. I also use a waterproof pen, as water will definitely come into contact with these labels, and they are going to look a little weary and waterlogged before the seedlings make it into the garden. In addition to the name of the vegetable, I also make note of the day they were planted. This information is helpful for future reference. 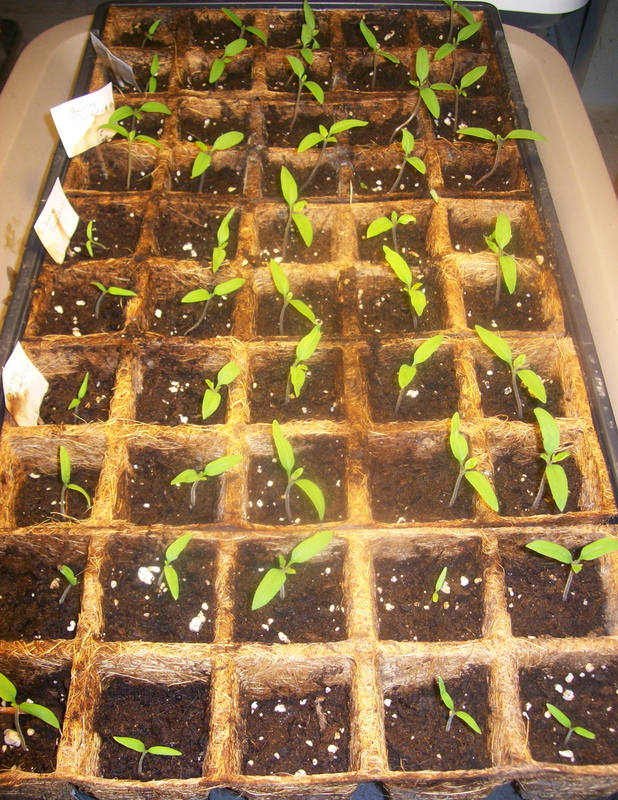 I have calculated that these twelve pots, fully filled and planted with seed, cost me less than two dollars. This is nowhere near what seedlings cost when purchased from a nursery, and I very much enjoy the satisfaction I get from doing it all myself. Initially, my potted seeds will spend about a week in my basement until they start to sprout. 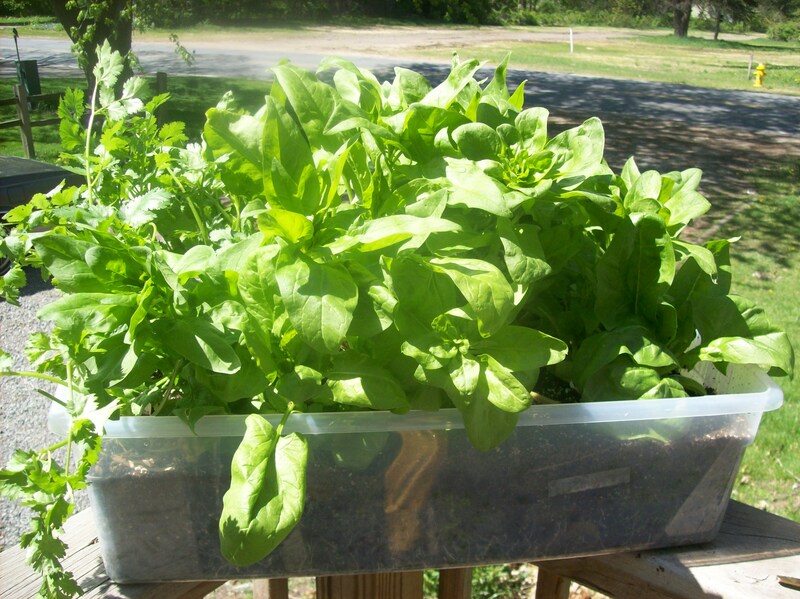 Then I will move them to a nice little sun porch on the west side of my house for my seedlings to stay while they are taking root and growing strongly in preparation for planting about mid-May. My crucifers, by the way, once planted also will have ground covers to protect them from insect infestation. But that’s another story, isn’t it?